Bali is home to a number of healthy food options but among the most addicting are the smoothie bowls. With a wide variety of flavorful local fruits, Bali has managed to create some of the most colorful and tasty smoothie bowls in the world. 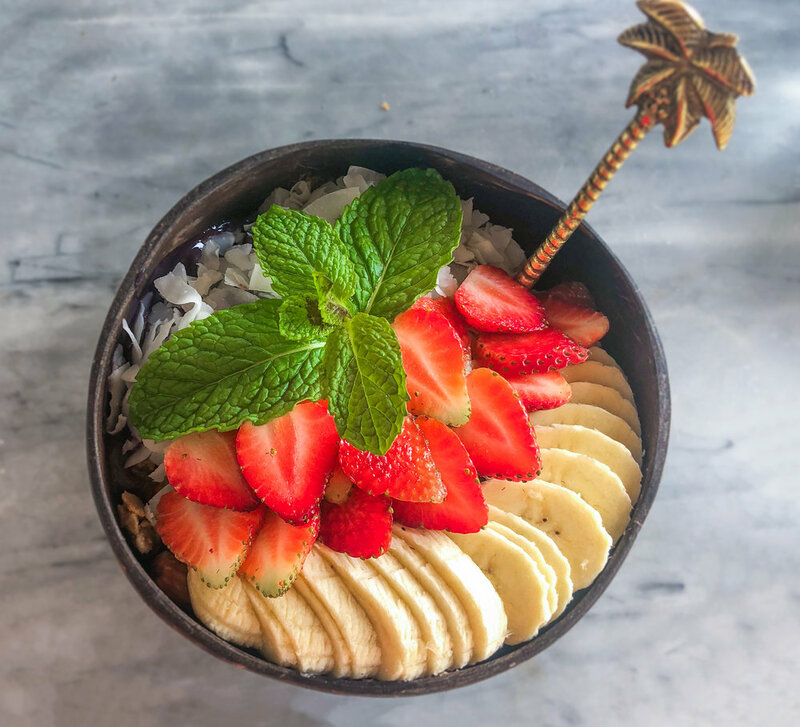 To help others navigate the many options in and around Canggu, we compiled a list of the prettiest and most delicious smoothie bowls we've encountered so far. Teeming with hip, minimalist vibes, Nüde offers a variety of simple and delicious foods that are bound to make you a regular here. The Pitaya Bowl (55k) features Bali's stunning pink dragonfruit. If you're looking for a savory treat to complement this bowl, we also highly recommend their pulled pork Breaky Burrito (90k). Although technically in neighboring Seminyak, the smoothie bowls at Kynd Community are so iconic that we had to include them on this list. They only have two smoothie bowl options but the Berry Tropical (73k) was the most delicious bowl we've had in Bali so far. As an added bonus, they'll write anything you request on your bowl so get creative! With their concrete walls, wooden crate seating, and industrial chic decor, Crate Cafe attracts some of the hippest clientele in Bali. They serve insta-worthy smoothie bowls and chia drinks and almost everything on the menu is 55k! Our favorite bowl is the Blackout (55k) which attractively swirls coconut milk into the berry base and has the fluffiest shredded coconut you'll ever taste. You don't have to be a vegan to enjoy Peloton Supershop. We balled out and got their two most expensive smoothie bowls: Blue Island (95k + 10k for the coconut bowl) and Moonshine Morning (80k). Each had the best presentation and tastiest granola of all the bowls on this list, making them well worth the higher prices. We'll definitely be back for the delicious pitaya dolphins! The elaborate jungle decor and views overlooking the rice fields easily make Milu one of the most picturesque restaurants in Canggu. Each of their smoothie bowls comes in a vibrant pastel color: pink, blue, green, or yellow and is served on an adorable pineapple-shaped tray. We opted for the Tropical Mango (60k), one of the few smoothie bowls we've seen with a mango smoothie base. If you like the mellow taste of mango lassi this bowl is for you! Ruko is a cozy cafe near Berawa Beach, making it the perfect spot for post-surfing munchies. They serve locally-sourced healthy food including several colorful smoothie bowls. We love their Charcoal Galaxy Bowl (65k), which gets its unique dark color from activated charcoal. Based on the color we were expecting a gritty charcoal taste but it surprisingly just tastes like mangoes and berries. This healthy eating cafe serves most of their menu items in signature coconut bowls, which are handcrafted by a local Balinese family. They take their smoothie bowls to another level by creating 3-dimensional fruit arrangements in each bowl. We recommend their eye-catching Maqui Bowl (85k). The Brazilian Açai Bowl (73k) here is hands down the best açaí we've ever had. The bold flavor and whipped texture is unlike any açaí bowl we've found in the States. Plus, this one comes with a heavy golden palm tree spoon to make you feel like tropical royalty. Did we miss any of your favorite smoothie bowls in Canggu? Let us know in the comments!